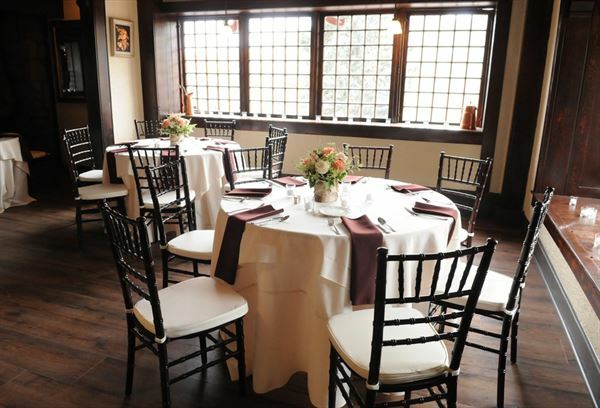 Built in 1910 in the Arts and Crafts style, The Craftwood Inn offers a unique and stunning setting for an enchanting wedding, special event or holiday celebration. This is Southern Colorado’s only boutique wedding and special events venue, complete with its own one-of-a-kind Bridal Cottage, Groom’s Den, and Fairytale Wedding Gardens for on-site ceremonies. The Craftwood offers Colorado comfort cuisine with impeccable food presentations and one-on-one planning for every wedding or event. Its creative and attentive staff ensures that every detail is attended to so that you do nothing but enjoy your Craftwood experience! Weekday Wedding Package (Monday through Thursday) Price for 50 guests Monday-Thursday: $4900 Ceremony Inclusions: Fairytale Cottage for the Bride Historic Gingerbread House for the Groom Sandstone Wedding Gardens for the Ceremony Chiavari Chairs Bridal Bouquet Groom’s Boutonniere Fruit Infused Water Station One hour of Ceremony Music Reception Inclusions: Tables, Chiavari Chairs, and Linen for Guest Seated Tables Floating Candle Centerpieces for Guest Seated Tables Stationary Hors D’oeuvres During Cocktail Hour Dinner Buffet (Includes Seasonal Fruit, Choice of Two Entrees, Choice of One Salad, One Vegetable and One Starch. Accompanied by a Smorgasbord of Fresh Baked Breads.) House Champagne for Toast Two Tier Wedding Cake with Floral Topper Two Hours of DJ Service Contact us for details regarding our Photography Package. Facility site fee included. Based on 50 Guests. Each additional person @ $62.00 All prices are subject to change and are EXCLUSIVE OF a 20% service charge and 9.03% Colorado State and Local Sales Tax. You must bring in your own officiant and your own photographer unless you purchase the separate Photography Package. Please contact us for our complete terms & conditions. Weekend Wedding Package (Friday through Sunday) Prices for 50 guests Friday: $6800 Saturday: $7300 Sunday: $6300 Ceremony Inclusions: Fairytale Cottage for the Bride Historic Gingerbread House for the Groom Sandstone Wedding Gardens for the Ceremony Chiavari Chairs Bridal Bouquet Groom’s Boutonniere One hour of Ceremony Music Reception Inclusions: Tables, Chiavari Chairs, and Linen for Guest Seated Tables Floating Candle Centerpieces for Guest Seated Tables Choice of Passed Hors D’oeuvres — 3 Pieces Per Guest Dinner Buffet (Includes Seasonal Fruit, Choice of Two Entrees, Choice of One Salad, One Vegetable and One Starch. Accompanied by a Smorgasbord of Fresh Baked Breads.) House Champagne for Toast Two Tier Wedding Cake with Floral Topper Three Hours of DJ Service Contact us for details regarding our Photography Package. Facility rental fee included. Based on 50 Guests. Each additional person @ $62.00 All prices are subject to change and are EXCLUSIVE OF a 20% service charge and 9.03% Colorado State and Local Sales Tax. You must bring in your own officiant and your own photographer unless you purchase the separate Photography Package. Please contact us for our complete terms & conditions. Beautiful views of Rocky Mt. foothills, vaulted ceiling, etched glass. Capacity 15-40 guests. Beautiful views of Pikes Peak and foothills. Attached restrooms. Capacity 35-60 guests.